of June, the same day when several countries including the United States. 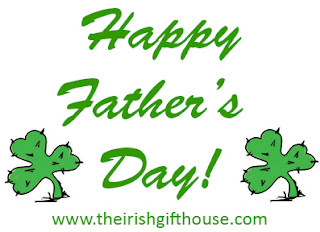 Many Irish cultural organizations organize Father's Day programs to stress on the important role played by father in the development of the child and a determined effort to make fathers realize that they must make all efforts to fulfill with commitment and devotion their responsibility as a father. Irish children are also encouraged to pay full attention and respect to their father. My own dear old dad was the son of an Irish lass who migrated from Ireland at the age of 17. She was soon employed as a domestic cook to help with family finances. She eventually married a young farmer and my father was born in 1903. Typical of Irish women the sun rises and shines on their sons and much to the chagrin of my mother who I believe was never considered quite good enough for grandma’s cherished son. Growing up in the forties, Father’s Day was not a big thing I can’t even remember celebrating a special day and of course there weren’t so many cards promoting everything under the sun back in those days. But for me, my dad was my hero and I was daddy’s little girl. Typical of the Irish culture and so many of the Irish immigrants that came to better their lives, dad demanded my brother and I would have to get an education or else. Hard work and education was stressed and that was his legacy to us. He didn’t live to see his eight grand kids and I still reminisce about the many outrageously funny if not hooligan type things he did and the many bits of wisdom he imparted from teaching me to drive, to being a good patriot and his always being there for me. So have a Happy Father’s Day to all dads’ everywhere. I can still feel those Irish eyes smiling down on me with that twinkle of mischief and Irish laughter. There is a song about an Irish dad that I play every so often by the Celtic Thunder group called The Old Man. Sure do miss him. The Irish Gift House wishes to thank guest blogger Barbara M. for this post.